Chittorgarh pronunciation (also Chittor or Chittaurgarh) is a city and a municipality in Rajasthan state of western India. 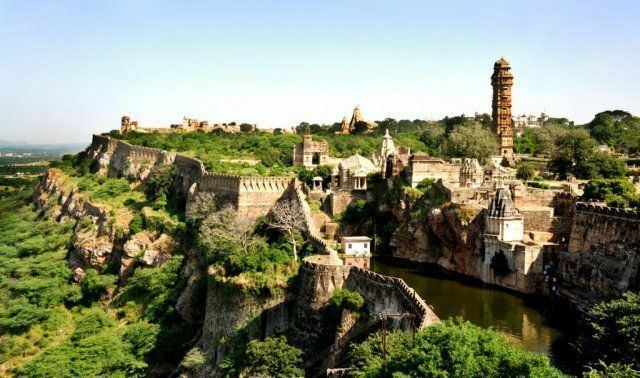 It lies on the Berach River, a tributary of the Banas, and is the administrative headquarters of Chittorgarh District and a former capital of the Sisodia Rajput Dynasty of Mewar. The city of Chittaurgarh is located on the banks of river Gambhiri and Berach. The district was bifurcated and a new district namely Pratap Garh was created with certain portion taken from Udaipur district in the newly created district of Pratap Garh. Fiercely independent, the fort of Chittor was under siege thrice and each time they fought bravely, thrice Jauhar was committed by the ladies and children. The sacrifice of Rao Jaimal and Patta, two brave army chieftains of Mewar, in the war against the Mughals (1568 AD) was so great that the Mughal Emperor Akbar installed their statues in the fort of Agra. It has also been a land of worship for Meera. Chittorgarh is home to the Chittor Fort, the largest fort in India and Asia. It was named Chitrakut after Chitrangada Mori, a Rajput chieftain as inscribed on ancient Mewari coins. The fort is surrounded by a circular wall which has seven huge gates before one can enter the main fort area. Some accounts say that the Mori dynasty was in possession of the fort when Bappa Rawal the founder of the kingdom of Mewar seized Chittor garh (Chittor fort) and made it his capital in 734 AD. Some other accounts say Bappa Rawal received it as a part of the dowry after marriage with the last Solanki princess. After that date his descendants ruled Mewar, which stretched from Gujarat to Ajmer, until the 16th century. Chittor was one of the most contested seats of power in India with probably some of the most glorious battles being fought over its possession. It is famous in the annals of the Mewar Dynasty as its first capital (prior to this, the Guhilots, forerunners of the Mewar Dynasty, ruled from Idar, Bhomat, and Nagda), and renowned in India's long struggle for freedom. By tradition, it remained the Mewar capital for 834 years. With only brief interruptions, the fort has always remained in possession of the Sisodias of the Guhilot (or Gehlot/Guhila) clan of Rajputs, who descended from Bappa Rawal. Chittorgarh was captured in 1303 AD by Ala ud din Khilji, Sultan of Delhi who led a huge army. Elderly people then had the responsibility to raise the children. 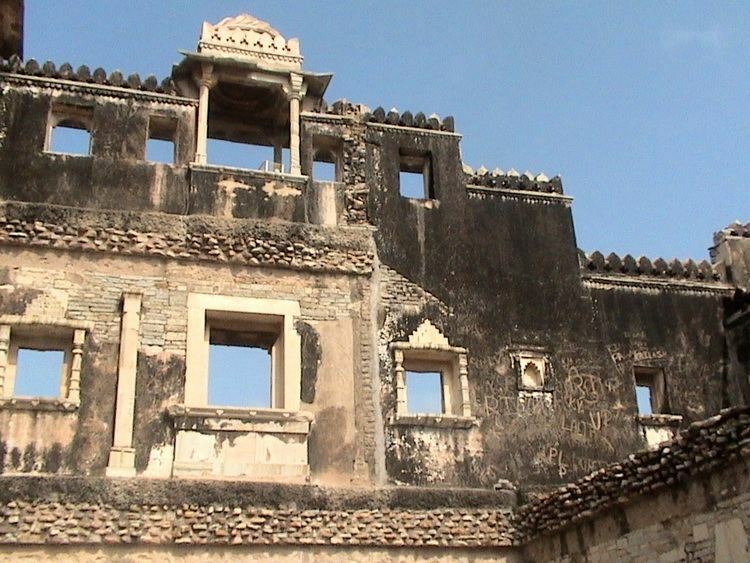 It was recaptured in 1326 by the young Hammir Singh, a scion of the same Gehlot clan. The dynasty (and clan) fathered by him came to be known by the name Sisodia after the village where he was born. Rana Kumbha (1433–68) was a versatile man, a brilliant poet, and musician. He built Mewar up to a position of unassailable military strength, building a chain of thirty forts that girdled the kingdom. But, perhaps more important Rana Kumbha was a patron of the arts to rival Lorenzo de' Medici, and he made Chittorgarh a dazzling cultural center whose fame spread across Hindustan. By the 16th century, Mewar had become the leading Rajput state. Rana Sanga of Mewar led the combined Rajput forces against the Mughal emperor Babur in 1527, but was defeated at the Battle of Khanua. Later in 1535 Bahadur Shah, the Sultan of Gujarat, besieged the fort, causing immense carnage. It is said that all 3,200 men then living in the fort donned the saffron robes of martyrdom and rode out to face certain death in the war, and their women folk committed Jauhar led by Rani Karnawati. The ultimate sacrifice for freedom, Jauhar was again performed for the third time after the Mughal Emperor Akbar captured Chittorgarh in 1568. Then, the capital was moved west to Udaipur, in the foothills of the Aravalli Range, where Rana Udai Singh II (the young heir apparent) had established a residence in 1559. Udaipur remained the capital of Mewar until it acceded to the union of India in 1947, and Chittorgarh gradually lost its political importance. Chittorgarh is also associated with two very widely known historical figures of India. The first, Meera Bai, is the most famous female Hindu spiritual poet, whose compositions are still popular throughout North India. Her poems follow the Bhakti tradition and she is considered to be most passionate worshipper of lord Krishna. Folklore says that her love for Krishna was epitomized by her final disappearance in the temple of Krishna in Dwarka. She is believed to have entered the sanctum of the temple in a state of singing ecstasy after which the sanctum doors are believed to have closed on their own. When they were later opened, the sari of Mirabai was seen enwrapped around the idol of Lord Krishna, symbolizing the culmination of her union with her Lord. The great Maharana Pratap, son of Rana Udai Singh II, is regarded as a personification of the values Rajputs cherish and die for. He took an oath to spend his life living in the jungles and fighting until he could realize his dream of reconquering Chittorgarh from Akbar (and thus reclaiming the glory of Mewar). It was the dream greatly cherished by Maharana Pratap, and he spent all his life to achieve this goal. He underwent hardships and a life of eating breads made of grass while fighting his lifelong battle. Maharana Pratap is the greatest hero in the eyes of the Rajputs of Mewar. In the absolute dark era of Rajput history, Maharana Pratap alone stood firmly for his honour and dignity, never compromising his honour for safety. With the reputation of a brave man of great character even among his enemies, he died free in 1597. Chittorgarh remains replete with historic associations and holds a very special place in the hearts of Rajputs, as it was a bastion of the clan at a time when every other stronghold had succumbed to invasion. It is often called as the "Bhakti aur Shakti ki nagari" (land of devotion and strength). The fort and the city of Chittorgarh also hosts the biggest Rajput festival "Jauhar Mela". It takes place annually on the anniversary of one of the jauhars, not the one by Padmini which is most famous. This festival is to commemorate the bravery of Rajput ancestors and all three Jauhars which happened at Chittorgarh. A huge number of Rajputs which include the descendants of most of the princely families do a procession to celebrate the Jauhar. 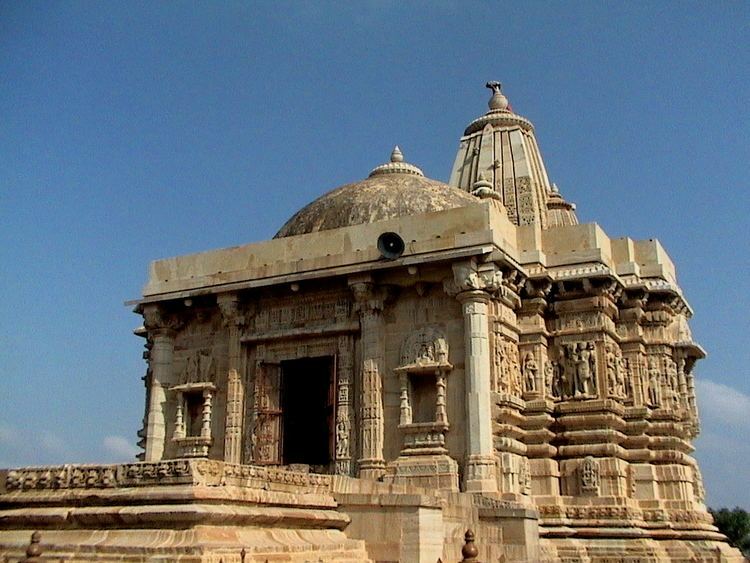 The fort at Chittorgarh also contains the ancient and beautiful temple to Goddess Kali called the Kalika Mata Temple. The antiquity of chittorgarh is difficult to trace, but it's believed that Bhim the legendary figure of the Mahabharata, visited this place to learn the secrets of immortality and became the disciple of a sage, but his impatience to perform all the rites deprived him of his goal, and out of sheer anger he stamped on the ground creating a water reservoir, this reservoir is called as Bhimtal. It's believed that Bappa Rawal the legendary founder of Sisodia clan, received Chittorgarh in the middle of 8th century, as a part of the dowry after marriage with last Solanki princess, after that his descendants ruled Mewar which stretched from Gujrat to Ajmer, up to the 16th century. 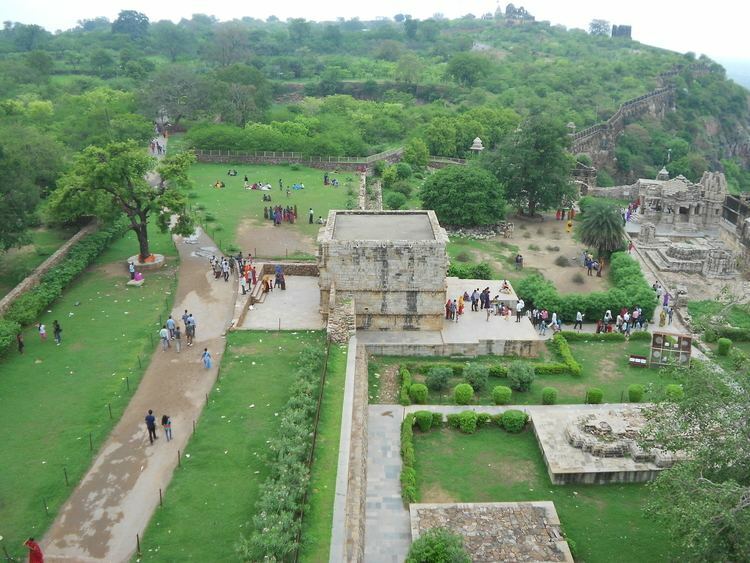 The ancient Chittorgarh city is used to be on the back side of Chittorgarh Fort. Ala ud din Khilji, Sultan of Delhi, rallied his forces against Mewar, in 1303 AD. The Chittorgarh fort was till then considered impregnable and grand, atop a natural hill. According to a court poet, Malik Mohammed Jayasi, Ala-ud-din's immediate reason for invading the fort was his obsessive desire to capture Rani Padmini, the unrivalled beautiful queen of Rana Ratan Singh. This is a purely fictional tale with NO historical basis. Jayasi goes on to narrate that the Rana, out of politeness, allowed the Khilji to view Padmini through a set of mirrors. But this viewing of Padmini further fired Khilji's desire to possess her. After the viewing, as a gesture of courtesy, when the Rana accompanied the Sultan to the outer gate, he was treacherously captured. Khilji conveyed to the queen that the Rana would be released only if she agreed to join his harem. But the queen had other plans. She agreed to go to his camp if permitted to go in a Royal style with an entourage, in strict secrecy. Instead of her going, she sent 700 well armed soldiers disguised in litters and they rescued the Rana and took him to the fort. But Khilji chased them to the fort where a fierce battle ensued at the outer gate of the fort in which the Rajput soldiers were overpowered and the Rana was killed. Khilji won the battle on August 26, 1303. Soon thereafter, instead of surrendering to the Sultan, the royal Rajput ladies led by Rani Padmini preferred to die through the Rajput's ultimate tragic rite of Jauhar (self immolation on a pyre). In revenge, Khilji killed thirty thousand Hindus. He entrusted the fort to his son Khizr Khan to rule and renamed the fort as 'Khizrabad'.Khizr Khan's rule at the fort lasted till 1311 AD and due to the pressure of Rajputs he was forced to entrust power to the Sonigra chief Maldeva who held the fort for 7 years Hammir Singh, usurped control of the fort from Maldeva by "treachery and intrigue" and Chittor once again regained its past glory. Bahadur Shah who came to the throne in 1526 AD as the Sultan of Gujarat besieged the Chittorgarh fort in 1534.The fort was sacked and, once again the medieval dictates of chivalry determined the outcome. Following the defeat of the Rana, it is said 13,000 Rajput women committed jauhar (self immolation on the funeral pyre) and 3,200 Rajput warriors rushed out of the fort to fight and die. In October 1567, the Mughal forces of approximately 5,000 men led by Akbar surrounded and besieged 8,000 Hindu Rajputs in Chittorgarh Fort. Within a few months, Akbar's ranks expanded to over 50,000 men and possibly more than 60,000 troops during the late phases of the siege, which ended in a decisive victory of the Mughals. The primary reason for Akbar's attack was because the Rajput had begun to emerge as a dominant power after the defeat of the Lodi dynasty. The Rajputs were opposed to the rise of the Mughal Empire and often supported Akbar's fellow Muslim rivals including Baz Bahadur, causing much tension in the region. Akbar set out on a series of campaigns against the Rajputs. In the year 1567 he fought many battles against the Rajputs and realized that the Rajput owned Chittorgarh Fort must be eliminated because it was used as a bastion for those who opposed him. On 23 October 1567, Akbar arrived and set up encampments. His personal presence in the battlefield was a message for the Rajput forces inside the fort that the siege was not a temporary affair. The next day, Akbar unleashed his powerful cannons, but within a few days of the siege it was evident that his mortars needed higher elevation. Akbar then ordered his men to build the Mohur Margi (Mohur Hill), also known as Coin Hill. After an arduous siege, Akbar ordered his men to lift baskets of earth during both day and night, in order to create a hill right in front of the fort by which the Mughal cannons could be placed. 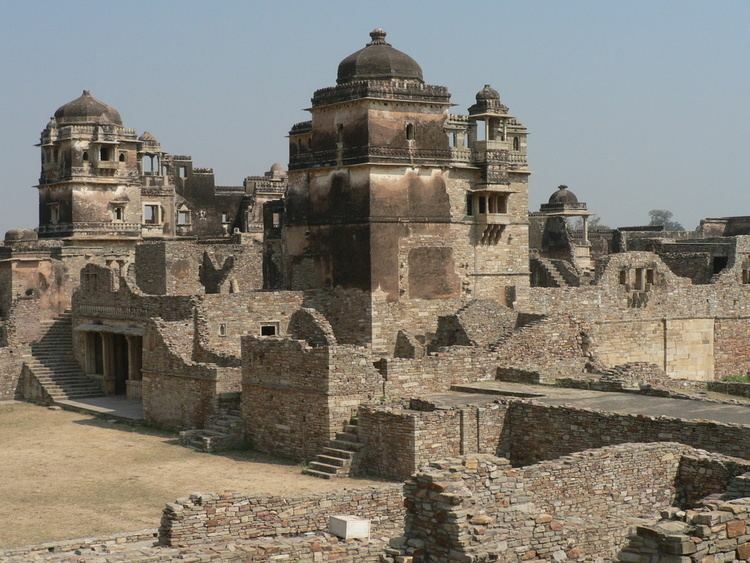 When the hill was completed, Akbar placed his cannons and mortars near its tip, but cannons were too slow to breach the thick stone walls of Chittorgarh Fort. Akbar believed that the only way to achieve victory and break the deadlock was to blow a hole underneath Chittorgarh Fort. Akbar then organized his sappers to dig two tunnels and to plant two separate mines under the heavy stone walls of the fortress. More than 5000 Mughals then dug their way through a secret tunnel which neared the gates of Chittorgarh Fort, but one of the mines exploded prematurely during a military assault, killing about a hundred Mughal Sowars. The casualties on the Mughal side had risen to almost 200 men a day due to Rajput muskets and archers. As the siege of Chittorgarh continued, a massive Mughal army of nearly 60,000 gathered for battle. In this situation, Akbar had prayed for help for achieving victory and vowed to visit the tomb of the Sufi Khwaja at Ajmer if he was victorious. As the bombardment and the continuous assaults on Chittorgarh Fort continued, during one particular assault it is believed that a shot from Akbar's own matchlock wounded or killed the commander of the already demoralized Hindu Rajputs. It was only when almost all the Rajput women committed Jauhar (self immolation) did The Mughals realize that the condition inside the fort was now out of control and that total victory was within grasp. The fortress of Chittor finally fell on February 1568 after a siege of four months, when it was stormed by the Mughal forces. Emperor Akbar ordered a general massacre and it is believed that thirty thousand soldiers and civilians were massacred in the aftermath. The only prominent commander who survived was Ram Singh Tomar of Gwalior, who later sacrificed his life in the battle field in famous Haldighati war of 1576. Chittorgarh is located at 24.88°N 74.63°E﻿ / 24.88; 74.63. It has an average elevation of 394 metres (1292 ft).Chittorgarh is located in the southern part of the state of Rajasthan, in the northwestern part of India.It is located beside a high hill near the Gambheri River.Chittorgarh is located between 23° 32' and 25° 13' north latitudes and between 74° 12' and 75° 49' east longitudes in the southeastern part of Rajasthan state.The district encompasses 10,856 square km (3.17 per cent of the Rajasthan State) area of land.. The completed Golden Quadrilateral highway system passes through Chittorgarh, connecting it to much of the rest of India. The East West Corridor (Express Highway) also crosses it. Chittorgarh is situated on National Highway No. 76 & 79. National Highway 76 connects to Kota with a driving time of 2 hours. Chittaurgarh Junction is a busy junction of Western Railway of Indian Railways, Ratlam Division. It has direct rail links with all major Indian cities including Ajmer, Udaipur, Jaipur, Delhi, Mumbai, Hyderabad, Kolkata, Pune, Yeshwantpur, Ahmadabad, Surat, Indore, Ratlam, Gwalior, Bhopal, Nagpur, Bilaspur, and Kota. Chittorgarh is well connected to all parts of India by roads. The Golden Quadrilateral Road Project and North-South-East-West corridor expressways pass through Chittorgarh City. The bus stand (bus depot) of Chittorgarh is located between the old and new cities. There are good bus services (private as well as state-owned) available for Delhi, Mumbai, Ahmedabad, Ajmer, Bundi, Kota, Udaipur and other major cities. Rajasthan Roadways (RSRTC) provides a service for visiting areas around Chittorgarh. Rajasthan Roadways also has premier services called Pink Line, Silver line and Sleeper Coaches (Grey Line). The Chittorgarh Fort seated on a 180-metre hill, covers an expanse of 700 acres (2.8 km2). It was constructed by the Mauryans in the 7th century AD. There is also a belief that it was constructed by Bhima of the Pancha Pandavas. This fort was the citadel of many great Indian warriors such as Gora, Badal, Rana Kumbha, Maharana Pratap, Jaimal, Patta, etc. Kalika Mata Temple was originally built in the 8th century for Sun God and was later converted to a temple for mother Goddess, Kali in the 14th century.During the festival days of Navaratri, fairs are organised and pilgrims from different places come here to pay obeisance at the temple. Vijay Stambha, is a huge nine storey tower which was built by Maharana Kumbha to commemorate his victory over the rulers of Malwa and Gujarat in 1440. The tower is 122 ft (37 m) high and stands on a 10 ft (3.0 m) high base. There are sculptures and carvings on the exterior walls of the tower. The tower is visible from any section of the town below. And for reaching tower top one have to climb 157 steps, one can take great view of the surroundings. The inside walls of the tower are carved with images of Gods, weapons, etc. Kirti Stambh (Tower of Fame) is a 22-metre-high (72 ft) tower built in 12th-century.Kirti Stambh is built inside Chittorgarh fort. It is dedicated to Rishabha, the first Tirthankara of Jainism. It was built by a merchant and is decorated with figures form the Jain pantheon.It is a seven storied pillar which was built by Biherwal Mahajan Sanaya of Digambar Jain sect during 12th century AD. On its four corners are engraved idols of Shri Adinathji in Digambar style which each are five feet (about 1.5meters) high and elsewhere are engraved several small idols consecrated to Jain lineage of deities. Rana Kumbha's Palace is near the Vijay Stambh. This is the birthplace of Maharana Udai Singh, the founder of Udaipur. His life was saved by the heroic act of the maid Panna Dhay, who replaced her son in place of the prince, with the result that her son was killed by Banbir. She carried the prince away to safety in a fruit basket. Rani Meera Bai also lived in this palace. This is the place where Rani Padmini committed jauhar with the other ladies in one of the underground cellars. Rani Padmini's Palace is from which Alauddin Khilji (one of the rulers of Khilji dynasty during the sultanate rule over India) was allowed to watch a reflection of the Rani by replacing the mirror at such an angle that even if he turned back he could not see the room. Khilji had been warned by the Rani's husband Rawal Ratan Singh that if he turned back they would cut his neck. Maharana Pratap Jayanti The legendary Maharana Pratap was a true patriot who initiated the first war of independence. Maharana was born on May 9, 1540 in Kumbhalgarh in Rajsamand district of Rajasthan to Maharana Udai Singh II and Rani Jeevant Kanwar.Maharana Pratap has gained amazing respect and honor as he is seen as an epitome of valor, heroism, pride, patriotism and the spirit of independence.His birth anniversary (Maharana Pratap Jayanti) is celebrated as full-fledged festival every year on 3rd day of Jyestha Shukla phase. Special puja and processions are held in his remembrance on Maharana Pratap Jayanti day everywhere.Several cultural programs such as debate are also organized. Meera Mahotsav Meera Bai (1498 - 1547) was a devout follower of Lord Krishna. Meera Bai was one of the foremost exponents of the Prema Bhakti (Divine Love) and an inspired poet. Mira Bai was a Rajput princess who lived in the north Indian state of Rajasthan.Meera was Rajput princess born in about 1498 in Metra, Rajasthan. Her father, Ratan Singh, was the youngest son of Rao Duda, ruler of Merta, and son of Rao Duda ruler and founder of Jodhpur. Ratan Singh belonged to the Rathore clan.She was married to Bhoj Raj, ruler of Chittor. Meera Smrithi Sansathan (Meera Memorial Trust) along with the Chittorgarh district officials organise Meera Mahotsav every year on Sharad Purnima day (On Mirabai's birth anniversary) for 3 days. Many famous musicians and singers get together to sing bhajan's in this celebration. The 3 days celebration also features puja's, discussions, dances, fire works etc. Teej Teej is one of the major festivals in Chittorgarh which is celebrated with great enthusiasm.Teej is the festival of swings. It marks the advent of the monsoon month of Shravan (August). The monsoon rains fall on the parched land and the pleasing scent of the wet soil rises into the air. Swings are hung from trees and decorated with flowers. Young girls and women dressed in green clothes sing songs in celebration of the advent of the monsoon. This festival is dedicated to the Goddess Parvati, commemorating her union with Lord Shiva. Goddess Parvati is worshipped by seekers of conjugal bliss and happiness. Gangaur The Gangaur Festival is the colourful and most important local festival of Rajasthan and is observed throughout the State with great fervour and devotion by womenfolk who worship Gauri, the consort of Lord Shiva during July-Aug. Gan is a synonym for Shiva and Gaur which stands for Gauri or Parvati who symbolises saubhagya (marital bliss). Gauri is the embodiment of perfection and conjugal love which is why the unmarried women worship her for being blessed with good husbands, while married women do so for the welfare, health and long life of their spouses and a happy married life. Jauhar Mela The fort and the city of Chittorgarh host the biggest Rajput festival called the "Jauhar Mela". It takes place annually on the anniversary of one of the jauhars, but no specific name has been given to it. It is generally believed that it commemorates Padmini's jauhar, which is most famous. This festival is held primarily to commemorate the bravery of Rajput ancestors and all three jauhars which happened at Chittorgarh Fort. A huge number of Rajputs, which include the descendants of most of the princely families, hold a procession to celebrate the Jauhar. It has also become a forum to air one's views on the current political situation in the country. Rang Teras – The Tribal Fair Rang Teras is a popular tribal fest of Mewar celebrated on the 13th moon night of the month of Chaitra. A big colorful fair and huge gathering of tribal to rejoice the harvest of wheat has been celebrating Rang Teras is customary since 15th century. It is a thanksgiving festival of farmers. Farmers pay their honor to Mother Earth for providing them food for next year.As a part of Celebrations, young men in village perform their valiant skills while dancing.It is also celebrated is Sri Krishna Temples all around North India and ISKCON Temples. Chanderiya Lead-Zinc Smelter is the one of the largest zinc-lead smelting complexes in the world. Its current metal production capacity is 610,000 tonnes per annum (525,000 tonnes per annum of zinc and 85,000 tonnes per annum of lead). In the year ended March 2013, Chanderiya produced 443,000 MT of zinc and 60,000 MT of lead. The main products are special high grade (SHG) zinc, continuous galvanizing grade (CGG) zinc, prime western (PW) zinc and pure lead. It also produces a number of valuable by-products including silver and cadmium. Marble Industry Chittorgarh one of large exporter of Indian Granite, Quartzite, Marble, Sandstone.Marbles Industry established in 20th century in chittorgarh Started in a small way, today it operates one of North India’s Biggest Marble Industry. It have captured a large segment of the Indian Granite, Marble, Quartzite, Sand stone and Imported Marbles. Fertilizers & Agrochemicals Industry Chittorgarh Fertilizer and Agrochemical industry today has succeeded in meeting the demand of number of chemical fertilizers and agrochemical products over the years. After the first manufacturing unit was started by the Indian Fertilizer Industry which was of Single Super Phosphate unit(SSP) in chittorgarh, there are number of Fertilizer and Agrochemical Units Running in Chittorgarh.Now Chittorgarh is leading Fertilizer Producer in Rajasthan. Woven Fabrics & Bags Industry This industry engaged in the manufacturing, supplying & exporting of an impeccable range of HDPE/PP woven sack for packing of various products like Cement, Fertilizer, Sugar, Food grains, Chemicals, Mineral Powder etc. Sitaram Mineral Suppliers are manufacturer of China Clay Powder which is used in the production of rubber, soap, detergent, paint and paper coating. Company was establish in 1998 and having around 200 employees. B.M. Industries, Chittorgarh B.M. Industries was establish in 1984. The Company is manufacturer of Marble Machinery, Multi Blade Gangsaw, Block Dressing Machine, Gantry Crane, EOT Crane, Heavy Mech. Spare Parts, Hydraulic Cylinder Shaft & Hardchrome Plating Works. The Promoter of this comapany has rich experience in this field and he is working in this field from 1977. He has received gold medal in Marble machinery Operation. An Fabric Processing, Manufacturer / Supplier unit in Gangrar which Supplier and Manufacturer of Suiting cloths, shirting cloths, cotton, polyester cloths. Star Cotspin Limited has carved a niche amongst the most trusted names in this business since 2009. The ownership type of our company is a Limited Company. Location of our P is in Gangrar Chogawadi Road, Chittorgarh Rajasthan and sales office is in New Delhi. Enriched by our vast industrial experience in this business, we are involved in manufacturing an enormous quality range of Polyester Yarn and Spun Yarn. Chittorgarh has brite future in manufacturing industry as well as tourism industry. Chittorgarh is largest and leading city in cement manufacturing and mining. Some big companies in cement manufacturing comesup in chittorgarh soon in future. Marble industry also spreading and manufacturing high quality marble and stone. Chittorgarh have number of crusher units in manpura, leading in agro food producing industry and also edible oil manufacturer in Rajsthan. Chittorgarh has largest Transport industry in South Rajsthan and also some MSME Ceramic, Wooden, Edible Oil Industry.